I've written before about the things I couldn't live without in my tiny house and the tools that were most important while we were building. One of our first trips after buying the land. 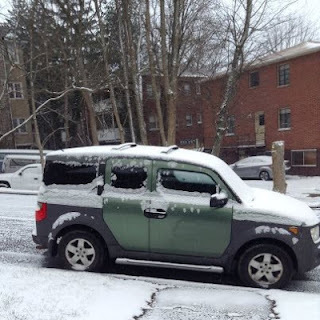 But there has been an unsung hero in our tiny house journey: our 2003 Honda Element. Matt bought the car new in 2003 the day we moved down to Atlanta from Michigan. See, he was driving a used Saturn and I was driving an old station wagon (a car I miss dearly but was totally impractical for Georgia). So I sold the car to my brother, who drove it for a while after that, and we moved down in the Saturn. But, of course, we needed a new car and Honda had just released the Element - a quirky, shoebox of a car. Eventually, over time, the Element became mine. We used that car to travel all over the south east exploring our new home. We drove it up to Michigan, even in a blizzard, multiple times. And, most importantly, it was the car the enabled us to build the tiny house. You can fit a surprising amount of things in a Honda Element. In fact, we've never lost the "that won't fit in there" argument. A small cement mixer and about a million bags of cement? Yep. We've camped in the Element. We've gotten lost in the Smoky Mountains in the Element. We've helped people get their cars out of the snow with the Element. And, after we found ourselves spending so much more time in town at the city bungalow, the Element became less essential. I work from home, I'm within walking distance of a number of things, and if Matt and I go somewhere together we take his car. I was driving the car, on average, about twice a month. It was just taking up space in front of our house. So I sold the Element. I posted the ad on Craiglist and less than 3 hours later, it was driving off with its new owner. Thank you, Element, for helping us make our dreams happen. Thank you for driving back and forth from Atlanta to Asheville countless times between 2007 and 2012 from the time we bought our land to the time we finished our tiny home. Thank you for helping us make our dreams come true. Hopefully you'll have a few more good years and be a good car for someone who really needs a reliable set of wheels.